Submitted photo A long-standing tradition at medical schools nationwide, Match Day is a highly anticipated event. It is the day that medical students learn where they are heading as new doctors to receive advanced clinical training in a residency program. FAIRBORN — One hundred eight medical students of the Wright State University Boonshoft School of Medicine learned where they will spend the next three to five years of their lives completing residency training after receiving their medical degrees in May. Surrounded by friends and family in the Apollo Room of the Student Union, each student received his or her envelope at noon. Some took a moment to read the match letter privately. Others waited for his or her envelope to be announced by Dean Margaret M. Dunn, M.D. In 2018, more than 44,000 applicants vied for more than 33,000 residency positions at institutions nationwide. The 2019 Match is expected to be even larger. Depending on where they match, students will spend the next three to five years as residents receiving advanced training in a primary care field or one of dozens of medical specialties. 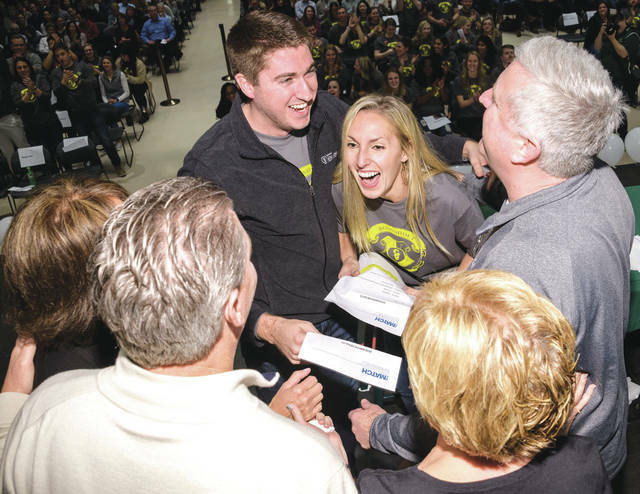 Wright State students matched in programs in Dayton, throughout Ohio and across the country, including Case Western Reserve/University Hospitals, Cleveland Clinic, Emory University and Wake Forest University. More than 44 percent of the Wright State graduates will remain in Ohio during residency, and 14 percent will remain in Dayton. More than a third (45.5 percent) will enter a primary care field (family medicine: 17.6 percent; internal medicine: 13 percent; pediatrics: 13 percent; and internal medicine/pediatrics: 1.9 percent). The rest matched in 13 other specialties: anesthesiology: 5.6 percent; dermatology: 3.7 percent; emergency medicine: 6.5 percent; neurological surgery: 1.9 percent; neurology: 3.7 percent; obstetrics and gynecology: 3.7 percent; ophthalmology: 1.9 percent; orthopaedic surgery: 5.6 percent; pathology: 0.9 percent; psychiatry: 9.3 percent; radiology: 2.8 percent; surgery: 8.3 percent; and urology: 0.9 percent. https://www.fairborndailyherald.com/wp-content/uploads/sites/50/2019/03/web1_matchday1.jpgSubmitted photo A long-standing tradition at medical schools nationwide, Match Day is a highly anticipated event. It is the day that medical students learn where they are heading as new doctors to receive advanced clinical training in a residency program.